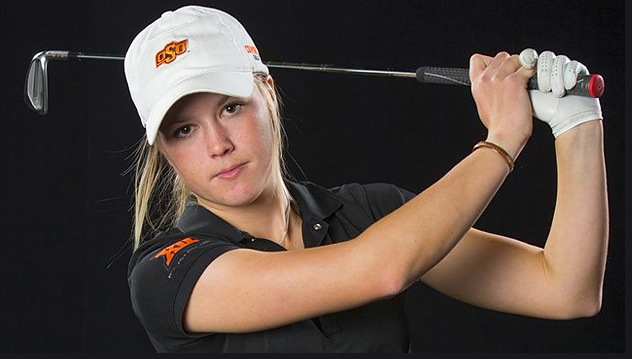 PALOS VERDES, Calif. — The Oklahoma State women’s golf team shot 9-over 293 to fall into a tie for 12th place after Monday’s second round of the Northrop Grumman Regional Challenge. Linnea Johansson carded birdies on three of the first seven holes, and finished at 1-under 70 for the day. She jumped 33 spots on the leaderboard into a tie for 23rd place at 4-over 146. The No. 18 Cowgirls entered the day tied for ninth at 13-over, and posted six early birdies to make a morning run up the leaderboard. However, OSU couldn’t sustain that momentum and slipped into a tie for 12th place after 36 holes. Florida was 9-under on the day, which moved the Gators into first place at 3-under 565. Florida’s Kelly Grassel leads all golfers at 5-under 137. Alexis Sadeghy also worked her way up the leaderboard. The junior shot 2-over 73 to move from 65th place into a tie for 58th at 8-over 150. Maddie McCrary and Kenzie Neisen will enter Tuesday’s final round tied for 40th place at 6-over 148. Chih-Min Chen is only two strokes behind at 8-over 150, and in a tie for 58th place.